Sean Eden is selling his black Fender Jazzmaster on eBay. The guitar was used extensively while he played with Luna and can be seen being used to great effect throughout Tell Me Do You Miss Me. 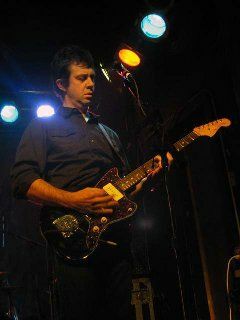 I am the original owner, and for those of you out there who might be fans of the band Luna, this guitar was one of two Jazzmasters used by me on tour and in the studio since 1999, and features very prominently in the Rhino/Warner Bros. documentary feature film "Tell Me Do You Miss Me". The starting price is $500 and the auction ends on the 2 May see the listing on eBay for more details and more technical information and pictures.